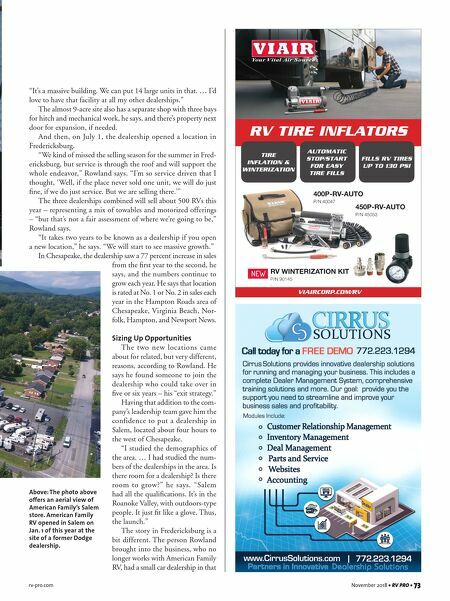 rv-pro.com November 2018 • RV PRO • 73 "It's a massive building. We can put 14 large units in that. … I'd love to have that facility at all my other dealerships." The almost 9-acre site also has a separate shop with three bays for hitch and mechanical work, he says, and there's property next door for expansion, if needed. And then, on July 1, the dealership opened a location in Fredericksburg. "We kind of missed the selling season for the summer in Fred- ericksburg, but service is through the roof and will support the whole endeavor," Rowland says. "I'm so service driven that I thought, 'Well, if the place never sold one unit, we will do just fine, if we do just service. But we are selling there.'" The three dealerships combined will sell about 500 RVs this year – representing a mix of towables and motorized offerings – "but that's not a fair assessment of where we're going to be," Rowland says. "It takes two years to be known as a dealership if you open a new location," he says. "We will start to see massive growth." In Chesapeake, the dealership saw a 77 percent increase in sales from the first year to the second, he says, and the numbers continue to grow each year. He says that location is rated at No. 1 or No. 2 in sales each year in the Hampton Roads area of Chesapeake, Virginia Beach, Nor- folk, Hampton, and Newport News. Sizing Up Opportunities The two new locations came about for related, but very different, reasons, according to Rowland. He says he found someone to join the dealership who could take over in five or six years – his "exit strategy." Having that addition to the com- pany's leadership team gave him the confidence to put a dealership in Salem, located about four hours to the west of Chesapeake. "I studied the demographics of the area. … I had studied the num- bers of the dealerships in the area. Is there room for a dealership? Is there room to grow?" he says. "Salem had all the qualifications. It's in the Roanoke Valley, with outdoors-type people. It just fit like a glove. Thus, the launch." The story in Fredericksburg is a bit different. The person Rowland brought into the business, who no longer works with American Family RV, had a small car dealership in that Above: The photo above offers an aerial view of American Family's Salem store. American Family RV opened in Salem on Jan. 1 of this year at the site of a former Dodge dealership.